Bake Swedish Apple Pie in a pie plate without a crust. Cinnamon-spice apples are covered with a sweet batter. Serve with ice cream or whipped cream. Attention all pie crust-a-phobes. Have I got a pie for you. No crust!!! It’s sweet, it’s cinnamon-y and it’s Swedish. Actually, I have no idea about the country of origin. It’s part of the title on the handwritten recipe I have. That’s all I know. Besides being my daughter-in-law’s favorite dessert, this recipe is all the more special because I got it from Amanda’s mother, Sandy. I especially enjoy eating it at her house. 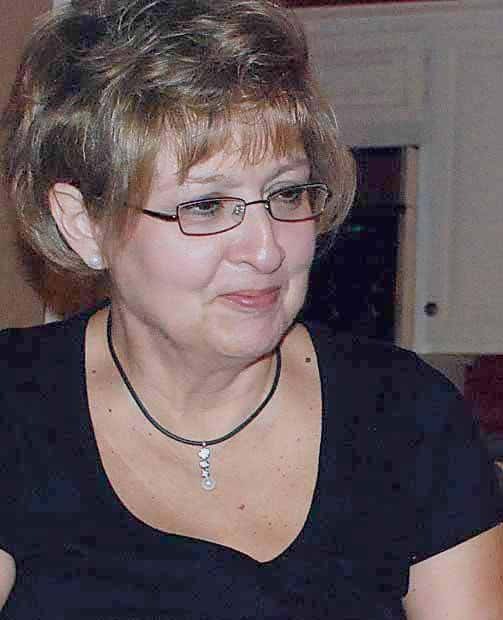 Which reminds me, Sandy is a hostess extraordinaire and I’m so thankful we get to share some birthdays and holidays together, often at her and Bob’s house along with the rest of the family. Sandy, thanks for an easy recipe. Tastes fabulous! I’ll think of you and Amanda every time I make it–which is the cool thing about sharing recipes. 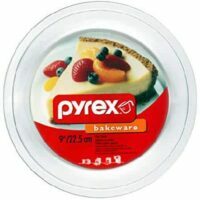 Lightly grease pie plate. Fill with sliced apples mixed with lemon juice. Pie pan should be about 2/3 full. 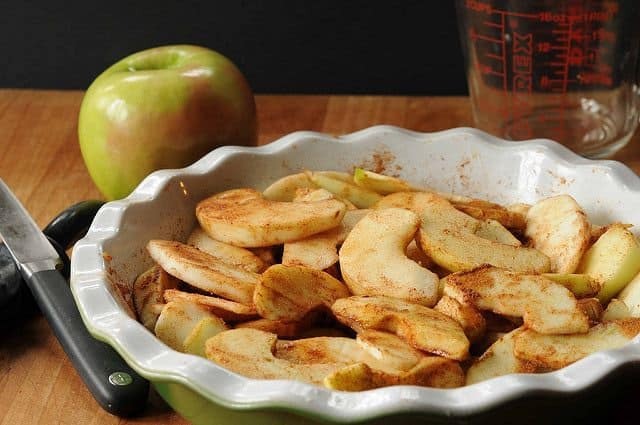 Sprinkle cinnamon and 3 teaspoons sugar over apples. Mix sugar, melted butter, and pecans in a separate bowl. Stir in beaten egg, flour and salt. 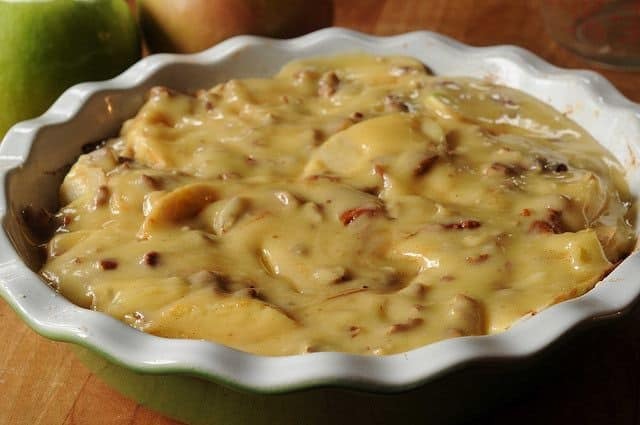 Spread over apples. Bake at 350 degrees for 45-60 minutes or until golden brown. i love this recipe. my batter came out stiffer then yours and i had to use my hands to spread it evenly, but it baked into a delicious pie. i also added an apricot and a peach to the apples, just to use them up, they were the last in the fruit bowl, and i think this pie would be equally nice made with just apricot or just peaches. can’t wait to make it again. this first one was gone in one day. Do you know the Weight Watchers smart point value? Or nutrition info? Thank you, Paula, Sandy and Amanda! This pie was fantastic and so easy to prepare. 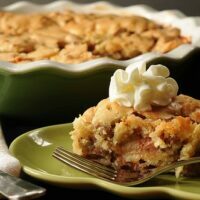 It’s like a cross between apple crisp and pie – heaven! It will certainly grace my Thanksgiving Day table this year. AMAZING!!! This is literally te best recipe I have ever found online! Even my apple hating brother can’t resist the taste of it. I’ve made more than three times in the last two weeks so good so buttery so sweet. Thank you so much for sharing such an amazing recipe. Glad to hear it. Easy too since you don’t have to make a crust! Thanks for writing. After perfecting the 1st attempt, this is surely a keeper. 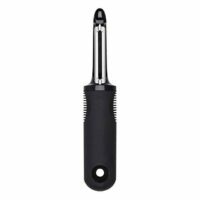 Not that I’m a crust-a-phobe, but it just makes life easier, (talking about a novice in the kitchen plus a 20 month old toddler, whew!) and you still get all that cinammony goodness, yum! Thanks a lot for sharing. Stay inspired Paula! So glad you liked the pie and thanks for writing to say so. Sometimes no crust can be a good thing. I love this recipe. Since I’m diabetic, I made it with Splenda. Because splenda makes things a bit dry, I added a splash of milk to the “dough” to help it go over apples easier. It worked pretty well though nothing would have been as good as pure sugar! If a person doesn’t like the amount of butter, I guess they could use Smart Balance. But nothing tastes as good as real butter! Thanks for posting the recipe. Inspired. Love how you improvised to suit your particular diet. Thanks for taking the time to write and share. This pie is amazing! Thank you for sharing the recipe. It’s so easy to make and so delicious! What size pie plate did you use since 2.5 cups of apples is not a whole lot. Gary, 9-inch. You are right–not a lot of apples. But this is not the traditional apple pie. It’s not cake either but the apples are bound together by a very thin but rich batter which is why you don’t need a crust to hold it. This is definitely one of the most popular recipes on this blog although certainly not original with me. Great! Thanks for your swift reply. It’s on the weekend menu! I am so excited about this recipe. I like different recipes that I have never tried before. Thanks. I had the pleasure of meeting two special members of your family last night at a book signing – Sandy & Amanda. It was fun to learn about your creative website. I look forward to making Sandy’s pie, as well as a few other recipes from salad-in-a-jar. Hi Tricia, Welcome. Know you must have had a great time seeing Pioneer Woman. Sandy’s pie is fabulous. You won’t be disappointed. Thanks for stopping by. Paula, would you please thank Sandy for me? My family loves the Swedish Apple Pie. I’m going to share your website with a friend who is a blue ribbon pie baker at the TX State Fair. Thanks so much – and I think your new photo with your treasured bowl is really cute. Thanks Tricia, and I’ll pass the word on to Sandy. I have been making this recipe for 10 years now and will never go back to a traditional 2 crust apple pie. It is always requested that I bring it for potluck’s and family get togethers. Over the years I have tried using margarine and sugar substitutes but nothing compares to the original recipe. I have not tried any substitutes myself so good to know. I’m always amazed at how popular this dish is considering how easy it is. I stumbled upon your website last week when I was searching for a balsamic salad dressing recipe, your creamy balsamic dressing was great but this pie recipe is to die for! Even my husband who is not usually a desert lover asked for seconds! I did cut the butter down to 8 T and am going to work on a few other edits to cut down on fat and calories as I know I will want to be making and eating this often! Thanks for posting, it was delicious. Can’t wait to try it! I’v passed it along to all on my mailing list…. I don’t want to eat anything that contains nearly one cup of sugar and 10 tablespoons of butter. I’ll pass … thank you. David, Each to his own. Only a small slice is needed for a special treat. Thanks for dropping by. Negative Nancy…I mean David – strikes again. Seriously, if you don’t have anything nice to say or constructive, why say it? Just…move along. I am definitely going to try this recipe today for Thanksgiving….as I realized I am out of shortening to make my crust! Thanks for the recipe, Paula. Thanks for sharing this fabulous looking recipe! I can’t wait to try it—I have always hated to make pies because of that obnoxious crust thing!! I’ll take this to the next Brother’s Keeper get-together at church…..
You will be the hit of the party. Be sure to serve with ice cream or whipped cream and of course, warm. I am going to have to try this recipe! Thank you! Ooh, one of my downfalls is apple pie! YOu’d think it was chocolate, but sitting here Sunday night was a French Silk Pie and a little apple galette I made with the leftover crust and I only took a little bite of the pie and ate way too much of the galette! Love the easy idea of no crust! What a fabulous looking pie! (And pie dish!) I am definitely going to be making this one before the end of the week! Can’t wait to taste it! 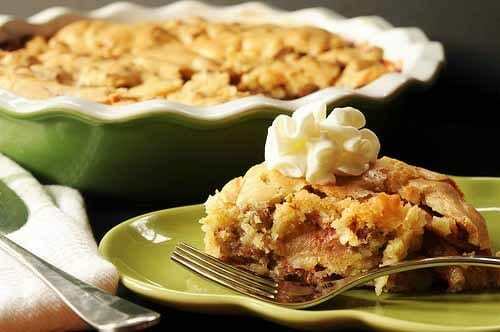 These are some of the most wonderful apple pie photos I’ve ever seen… this looks WONDERFUL! 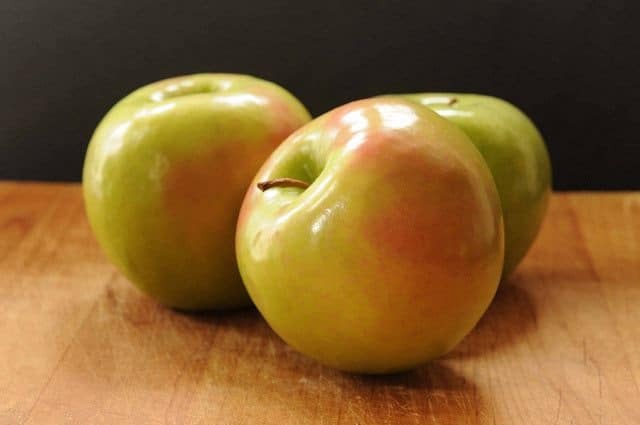 Now… are “cooking” apples Granny Smith or Golden Delicious? I just inherited a bunch of Fuji’s from work…. and yes, I’m a recovering crust-a-holic. I’ve made one too many bad ones! such a delicious recipe, am so glad it made it to the blog! ♥ from one apple pie lover to another! Thank you Paula for featuring one of my favorite recipes. I usually only make it on special occassions when there are plenty of friends and family to help me eat it. Your pie turned out beautiful and I could almost taste it just by looking at it. Thank you for the kind words. I love having an extended family. Nice idea to skip the crust, I’ll count that as a calorie savings, making this a reduced calorie apple pie. See how I am working it into my diet. Looks great and perfect for me as I am not a pie crust lover. Unfortunately, my husband is but he will eat anything sweet!! Well, anything really! Can’t wait to try it!! You always make the most YUMMIEST (is that a word?) recipes! Love not having to make a crust. I’m going to have to try this one out…. Hunk and the rugrats are sure to love it. I love the idea of no pie crust! I will have to try this recipe! That looks so delicious, and how nice that there’s no crust to roll! The topping looks a little questionable before baking, but it sure looks good after! I would really love a piece of this. Looks so pretty and delicious. Beautiful photo.